Labor of Love - Take a Break Already! It’s Labor Day Weekend! Time to get away from the daily grind and immense yourself in Nature’s Playground at Lake Tahoe. Visit LakeTahoe.com for our Top Ten lists and 180 things to do! Labor of Love – Take a Break Already! Labor Day Weekend! 3 Days Off! You know what that means? Time to get away from your job, away from the desk, away from the tool box, away from the wheel, away from stress and pressure to produce results and instant gratification for the impatient on the planet. Phew! Labor Day is meant to be a break from labor so… Take a break for Pete’s sake! Time to gather with some friends and family you haven’t seen in a while. Time for a special getaway with your partner so you can reconnect and explore new soon-to-become favorite places. It’s good for mind and body to take a break and mix it up. Routine is just too easy to follow and you deserve to treat yourself to a little more of what Life offers. There’s a whole world of wonder to discover, so what are you waiting for? Time is your most precious resource, do something with it! Well? Of course one of the best ways to do this is to just get out of Dodge! A change of environment removes you from the opportunity to revert to routine. You’re FREE!.... to go biking, hiking, camping, fishing, swimming, travelling and taking in views from beautiful places with that extra time. Getting out and about in a boat (favorite saying) on Lake Tahoe adds a whole new element and perspective to Life. The views… The views! Well, after you stop staring at the water - which is unbelievably ultra-blue out there, you look up and notice you’ve got 360 panoramas of amazing mountains - everywhere! There is a lovely sense of newfound freedom when you take a boat out on Lake Tahoe. It’s an overwhelmingly beautiful expanse of water, and we all love it. Even land lubbers cannot deny its allure. Once you’re out in the open Lake, there are no lanes to confine you, no rear bumpers to follow, no immediate neighbors, no media propaganda, and no signs saying don’t do this or that… Freedom – what America is supposed to symbolize! This a slice of it in full that you deserve to experience. Bring your own boat (get the inspection sticker!) or simply hop on one of several boat tours and get the sensation. It’s all good. 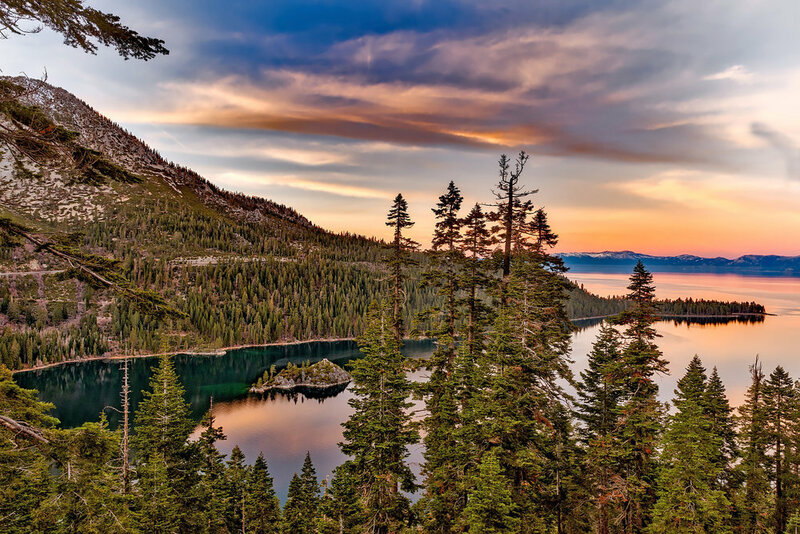 Along the water lines, a unanimously favorite spot for nearly all boaters is a trip to Emerald Bay, and it’s easy to see why it gets the attention - it’s a fabulous place. Photos of Emerald Bay are merely a tease; you have to go there to fully appreciate it. You can spend a goodly part of your day exploring this historically rich location, and you don’t need a boat to do it. You can park above by Eagle Falls and take it in from several viewing spots, or hike down to Vikingsholm where there is (yep) another very nice beach – strangely called Emerald Bay Beach. Then there is Fannette Island, the only island on Lake Tahoe, forms a striking centerpiece to this idyllic spot with its stone tea house perched atop. If you’d like a closer look at this most photographed place on the planet, you can rent kayaks to paddle out and about... You’ll be saying it all the time too… If you’re looking for yet more of a workout (and probably easier parking), I’ve even paddled out there starting from Kiva Beach. If you’re in the mood to take in more views and enjoy mild to moderate hiking, several trailheads (Eagle Falls and Bay View) rise up from Hwy 89 heading toward Desolation Wilderness. In fact, if hiking is your thing, Tahoe is a hiker’s paradise. Day hikes are spectacular to Desolation where gem-like lakes are scattered as prime destinations for a lunch and/or a few casts to rising trout before hiking back out - when you’ll probably be hungry again… Most of the lakes are from 1-3 hours in, and shorter coming down (of course). Hiking is undeniably one of the better forms of exercise you can engage in, it requires little gear, and you can go at whatever paces suits you. Along with the inspiring scenery, you’ll get the endorphin rush, even at a moderate pace. There are numerous trails all around Lake Tahoe, suited to various skill levels and ambitions. Fill up a daypack with water and snacks - and go! Hiking in these surroundings will open up your heart and mind to another great reason to be alive!